Long Beach is located just ten minutes north of Batemans Bay. Take the Long Beach turn off (Cullendulla Dr) located four kms north of Batemans Bay on the Princes Hwy and then continue on this road another 4 km to 45 Long Beach Rd. If you go to far you will find yourself looking at the beautiful sandy strip and picnic grounds of Long Beach. Sea Nest combines the beauty and seclusion of the bush with the sparkle of the sea just minutes away. Wake up with to the music of the local parrots in a cosy, architecturally unique, yurt. Sea Nest is a unique property; a modern Yurt. This large hexagonal building is fully self-contained complete with full sized kitchen. 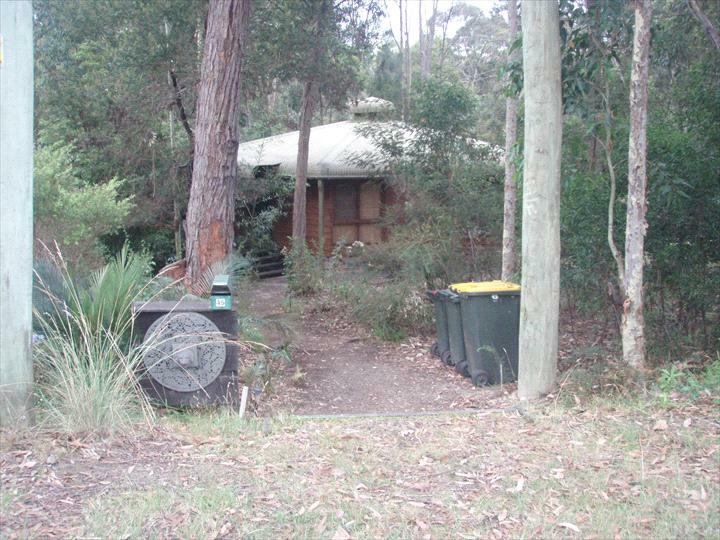 Sea Nest has no obstructions to the panoramic views of the bush. The Yurt is furnished with a queen size bed, comfy leather lounge, large dining setting, 51" plasma TV, DVD and much more. The solitude and ambience is perfect for a romantic getaway, or just a break from the rush of life. Sit on the wrap around balcony and watch the grazing kangaroos or have the local parrots come and visit. If you are a little more adventurous you can take a casual 6 minute stroll down to beautiful Long Beach where you can paddle in the crystal clear water or just wander along the picturesque sandy beach. Directions: Long Beach is located just ten minutes north of Batemans Bay. Take the Long Beach turn off (Cullendulla Dr) located four kms north of Batemans Bay on the Princes Hwy and then continue on this road another 4 km to 45 Long Beach Rd. If you go to far you will find yourself looking at the beautiful sandy strip and picnic grounds of Long Beach. This unique property is a yurt, large hexagonal room fully furnished with queen size bed and comfortable leather lounge, dining setting, 51" plasma TV and more. Ideal for a romantic getaway, or just a break from the normal rush of life. Sit on the wrap around balcony and watch the grazing roos or have the local parrots sit and visit. If you are a little more adventurous you can take a small stroll down to beautiful Long Beach. Any booking cancelled within 48hrs of booked date will incur a 25% cancellation fee that will be taken from the deposit paid.